Private Driving Lessons available for all ages and all skill levels. New to the United States? We’ll help build your confidence on the other side of the road on this side of the pond! Learn to drive in real world situations. Build confidence with ability at your pace, click or call for details. 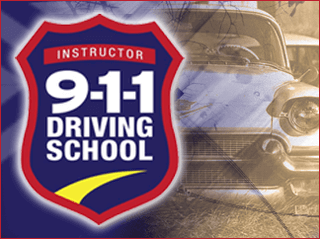 911 Driving School of Seminole County develops the exclusive drivers education program by bringing over 65 years of law enforcement experience and hiring only the finest police officers to instruct our teen and adult drivers. The very best safety device anyone can install in a vehicle is a well-trained driver. Police officers are highly skilled in every aspect of vehicle control after undergoing extensive training and honing those skills through years of patrolling and being witness to tragic crashes when drivers make poor decisions or fail to eliminate the risks faced when driving on today’s roads. Trust the very best to teach your student the important life skill to be a safe driver! 1. Behind the Wheel Driving Lesson (1 Hr) 1 Hour Behind the Wheel Driving Lesson for an adult or teen. Instruction provided in a 911 training vehicle. Welcome to 911 Driving School of Seminole County. For new customers only. For full terms and conditions please call for details at (844) 251-5911.